Black and brown communities have long borne the brunt of our addiction to fossil fuels—and now they are leading the fight for a post-carbon economy. The day before the People’s Climate March in Washington, DC, Preyton Lambert—skinny, dreadlocked and sporting black-frame glasses—was getting hustled on a boulevard near the National Mall. Another boy restrained his arms, before throwing him to the ground. His cheek pressed against the pavement. Two girls recorded the encounter on their phones as a crowd looked on. So what does police brutality have to do with issues like carbon emissions, rising global temperatures, water pollution and government-by-oil-corporations that have dominated mainstream climate discourse? Standing before the Capitol Reflecting Pool at the 200,000-strong Climate March the following day, Katherine Egland, the chair of the Environmental and Climate Justice Committee for the NAACP National Board of Directors, argued that, because low-income minority communities suffer the most adverse impacts of environmental pollution and climate change, this is also where the transition away from fossil fuels should begin. In the east of Egland’s home state of Mississippi lies Kemper County, Mississippi, which is 60 percent African American and was home to some of the highest numbers of lynchings in the state from 1877–1950. It is also where the Kemper Project, soon to be operational, is located, an experimental “clean coal” plant that was a keystone of President Obama’s climate plan for reducing carbon emissions. The only major coal plant currently being constructed in the country today, it would be the first large-scale plant to use the energy-intensive Carbon Capture and Storage technology (which gasifies the coal, captures the carbon emissions, and stores them in the ground). Kemper County is hardly the only black community to be sited near a coal plant: At least 68 percent of African Americans live within 30 miles of a coal-fired plant, compared with only 56 percent of the white population. This kind of data has largely been eclipsed by the numbers trumpeted by the climate movement: limiting atmospheric carbon emissions to 350 parts per million, and capping global temperature rise to 1.5 degrees Celsius. 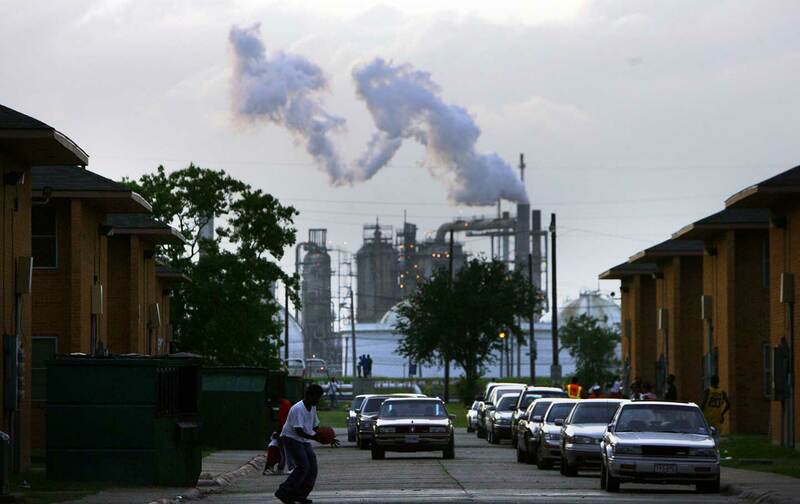 But the racial disparity among victims of environmental pollution are stark: African Americans are exposed to 38 percent more polluted air than whites, and are 75 percent more likely to live in chemical-factory “fence-line zones” than the US average (Latinos are 60 percent more likely). And as global temperatures rise, climate change will also impact poor communities of color more drastically: Heat-related deaths occur at a 150–200 percent higher rate among African Americans than among whites, likely because cities tend to run a few degrees hotter than their surroundings (the “heat island effect”), and most African Americans live in cities and suburbs. As extreme weather grows more frequent, vulnerable communities will become yet more vulnerable. These communities remain deeply underrepresented in the climate movement. 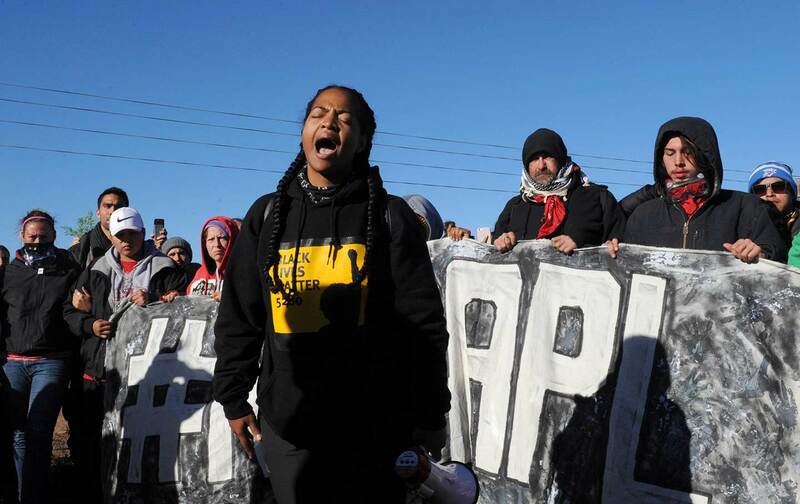 “When you have to decide between going down to do something about climate change or trying to feed your children, or worrying about police brutality—those kinds of things take immediate precedent over the longer-term issues of air pollution and soil erosion,” said Jazzlyn Lindsey, standing alongside her Black Lives Matter delegation at the march, the whole crew dancing and drumming on overturned buckets. Some say that the environmental-justice movement is centuries old: Native Americans have been resisting the theft of their lands since the white man arrived; the Chicano-led United Farm Workers have been fighting pesticide use in the fields since the sixties; and black sanitation workers—the keepers of the urban environment—have been protesting unfair working conditions since the Memphis Sanitation Strike of 1968—where Dr. King was heading when he was assassinated. Yet race has remained a consistent blind spot in the environmental movement. This has begun to change as public attention alights on Native communities along the Dakota Access and Keystone XL pipelines. But without directly addressing how environmental injustice impacts poor communities of color disproportionately, racial and economic inequality is likely to deepen as climate change grows more disruptive. At least 68 percent of African Americans live within 30 miles of a coal-fired plant, compared with only 56 percent of the white population. Climate change’s impacts can most frequently be felt through water: too much after a storm, too little during a drought, and how we manage and distribute it in between—mni wiconi, in other words: “Water is life.” Hurricanes Katrina and Sandy have battered America’s shores, and droughts in rural Syria helped fuel the civil war (migration to the cities exacerbated religious and political tensions), much as a severe water shortage is now fueling the civil war in Yemen (the capital city, Sanaa, could run out of water as early as this year). But subtler environmental changes are also wreaking havoc around the country. Near Bethel, Alaska, gradually warming temperatures and coastal pollution are threatening the subsistence lifestyle of Julien Jacobs’s Alaska Native Yup’ik community. “We’re seeing waves wash over villages, and we’re also seeing a break in our entire ecological system,” he said. What will become of their culture if the whale, beluga, salmon, caribou, and moose they harvest become extinct? Elsewhere in the United States, coastal retreat poses an existential threat to communities with identities connected to the land. On the Gulf Coast of Louisiana, which loses a football field’s worth of land to the sea every hour, an entire indigenous community—Isle de Jean Charles—is relocating. Already, a matrix of pipelines and canals carved into the wetlands by the oil industry are exacerbating erosion, but Energy Transfer Partners is still planning to build the final leg of its Dakota Access pipeline, the Bayou Bridge, across 11 parishes, including the freed-slave community of St. James. This parish is surrounded by oil refineries and LNG terminals (the area is known as “Cancer Alley” for illnesses connected to the facilities), and according to Cherri Foytlin, state director of Bold Louisiana, they want to evacuate too. Some communities live off the land more directly than others, but all communities remain inextricably connected to the earth; even Soylent, sometimes dubbed “the end of food,” is made from plants. In California’s Central Valley—America’s produce basket—drought and rising temperatures are already pushing Mexican farmworkers to migrate north to Bellingham, Washington. Edgar Franks, an organizer with Community to Community, a Bellingham grassroots organization for food sovereignty and immigrant rights, recalls them talking about getting nosebleeds and passing out from the 115 degree heat. Cooler climates awaited them in Washington, but the large industrial farms remain, as do the threats of ICE raids on the workers keeping the agricultural industry afloat. Faith Spotted Eagle—the Yankton Sioux Tribe grandmother famed for resisting Keystone XL under Obama—calls the centuries of “manifest destiny” that robbed indigenous Americans of their land, their livelihoods, and often their lives a “holocaust.” The Indian Wars, which accompanied the largest land-grab in US history, were intended to secure farmland and natural resources for white settlers, and were carried out through the mass displacement, genocide, and confinement to reservations of Native people . Many at the Standing Rock encampment saw their treatment by Energy Transfer Partners and local police (who deployed dogs, tanks, flash grenades, and sound cannons against the water protectors) as just its latest iteration. Now Spotted Eagle is reviving the Cowboy and Indian Alliance—the coalition of white landowners and grassroots indigenous activists who rode into Washington and helped bring down Keystone XL in 2015—in response to the newly resurrected Dakota Access and Keystone XL pipelines. 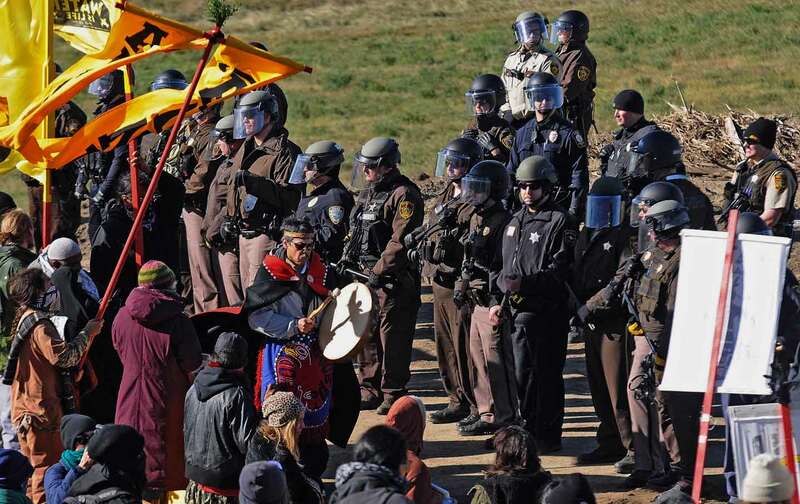 But this is not the only component of the Sioux resistance against the fossil-fuel government. Along the sidelines of the Climate March, Spotted Eagle spoke with pride of the wind farms that her South Dakota tribe, along with six other Sioux tribes, was launching through the Oceti Sakowin Power Authority (established in 2015, it includes the Standing Rock Sioux Tribe as one of its members). This came about after a series of failed attempts by outside developers to harness the muscular prairie winds for a share of the profits. “So we became our own developers,” she said. The result was the first tribal public power authority in the United States, an independent, nonprofit entity to construct and operate renewable energy resources at a local scale, and for the benefit of the community. Owned and controlled by the tribes (Spotted Eagle is on the advisory council of elders), the agency is designed to distribute surplus revenues back to the tribes for use in local development. And it also provides affordable clean energy to tribal ratepayers, helping to weaken the stranglehold of the fossil-fuel industry, and shoring up their self-reliance and sovereignty. Community-owned renewables are not only a rural or tribal phenomenon. They exist in cities throughout the United States (including Los Angeles; Seattle; and Chattanooga, Tennessee), with residential customers of public power utilities paying average electricity rates that are 14 percent lower than for investor-owned utilities. In the Brooklyn neighborhood of Sunset Park, home to a sizable Latino and Chinese immigrant population, the community group UPROSE is working on three solar projects that will be community-owned and -governed, and will lower electricity costs for local subscribers (low-income households will be prioritized). But these solar projects are only one part of their larger vision for neighborhood development. At the center of her concerns is Sunset Park’s waterfront, home to one of New York City’s six Significant Maritime and Industrial Areas (where heavy industry is clustered). “But we’re losing it because of speculating developers who are turning it into the next destination location for the privileged,” she said. As in other gentrifying neighborhoods, skyrocketing housing costs are already pushing many low-income residents out of Sunset Park. But reserving that waterfront space for green manufacturers (and possibly offshore wind turbines) would not only slow this process but also provide local green jobs. “The industrial sector is the vehicle for our salvation,” she said. To this end, UPROSE is part of the New York Renews coalition that is drafting state legislation to levy fees against companies for greenhouse-gas emissions, with 40 percent of the revenue to be earmarked for green-energy investment in “disadvantaged communities”—a statewide policy that could encourage decentralized, community-owned renewable energy. (The week of the Climate March, Senators Bernie Sanders and Jeff Merkley also introduced a similar federal bill, the “100 by 50” Act, but with a Republican-controlled Congress and an administration staffed by climate-science deniers and fossil-fuel executives, this was largely symbolic). Five years ago, California paved the way with a similar piece of legislation, Senate Bill 535, and Vien Truong, director of the Van Jones–founded organization Green for All, helped push it through. Truong was born in a Hong Kong refugee camp to parents fleeing Vietnam, but grew up in the Oakland neighborhood known at the time as the “Murder Dubs” because it had the country’s highest homicide rates. It was the kind of place where “you don’t think about climate justice. You think about murder, drugs, education,” she said. Life expectancy in parts of Oakland were comparable to North Korea’s—but this turned out not to be only because of the murders. There was also groundwater contamination, an abundance of freeways bordering the Murder Dubs, and a lack of fresh food. So when California began considering cap-and-trade—a scheme requiring companies to pay a penalty when they exceed a limit on emissions—Truong saw an opportunity. “Cap-and-trade can either hurt or help us,” she said. “If you do it wrong, you actually force polluters to move their pollution to the poorest, polluted communities, and clean up the richer and more affluent areas.” Her coalition secured a requirement that 35 percent of the revenue be reinvested in California’s most polluted census tracts—communities with some of the highest asthma and infant mortality rates, rent burdens, and numbers of high-school dropouts. Once the funds began rolling in, the communities chose how their allotments would be spent: trees to break up the concrete jungle, affordable housing to combat gentrification, bus passes for seniors, and free solar panels. This in turn created local jobs in solar installation, energy efficiency, and public transportation. Critics argue that cap-and-trade, like fining small-scale drug dealers to curb organized crime, fails to address the root of the climate crisis: the limitless economic growth and endless consumption that lie at the heart of capitalism. (These critics include Pope Francis). Others believe that, short of ending capitalism tomorrow, a just transition to renewables will require redistributing wealth from polluters to the most polluted communities (through policies like SB 535 and New York Renews). 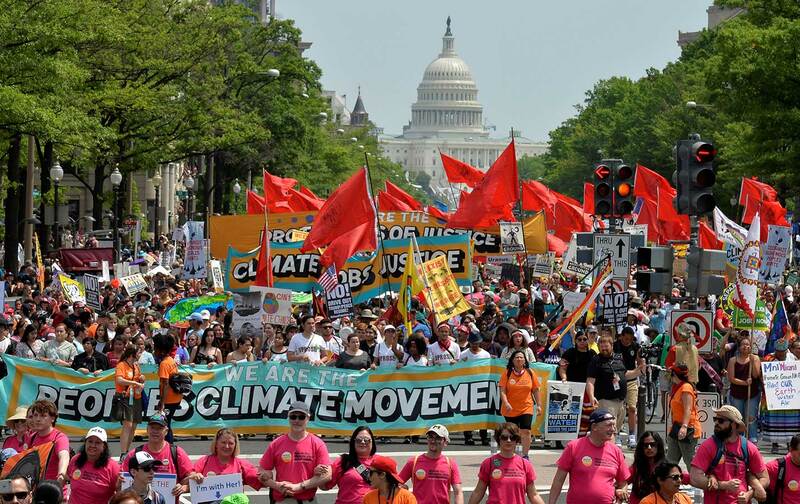 Either way, the grassroots campaigns agree that the fossil-fuel era must end. “Trump’s here wasting money on walls when we need water and food,” said Preyton Lambert, still buzzing from his performance. In fact, this broader view of climate justice, which also encompasses issues of inequality, oppression, and sovereignty, hints at a more profound truth: The climate crisis offers a unique opportunity to reshape our economic system, and to create real alternatives to the profit-driven, fossil fuel–dependent system of white, corporate capitalism.